Ahh…. Red Velvet Cake. What a fantastic challenge! The first time I ever tasted Red Velvet Cake was six years ago at Regas Restaurant in Knoxville, Tennessee. I was reluctant to try a nibble after I was told the cake was made with cocoa and the frosting made with cream cheese. Cocoa and cream cheese = icky. However, after my mother-in-law convinced me to take a bite of her piece, I ordered a ginormous piece of my own. It was SO stinkin’ good! 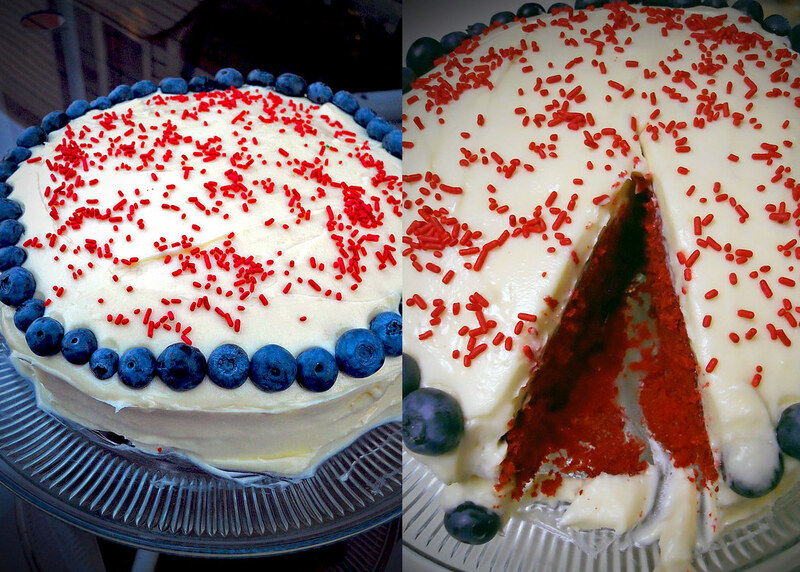 My husband and I eat Red Velvet Cake on special occasions: birthdays, anniversaries, holidays, Fridays, etc. It is our most favorite cake in the whole wide world. The one time I attempted to make my own cake, I used mix from a box and it came out very dry. I also attempted a cream cheese frosting that turned out too runny and a bit sour. Since then I’ve only partaken in the eating of the cake, and not the baking. For my fourth Yankee Challenge, I turned to Paula Deen (Southern Food Queen) for some assistance. I figured that one of the country’s most renowned Southern Kitchen Queens would have a recipe for a Red Velvet Cake that I could follow. After my trip to the grocery store, I laid out my ingredients and got to work. I don’t own a big fancy shmancy Kitchen Aid Mixer, so I had to use a hand mixer. Talk about a disaster. My hand mixer has a serious amount of power even at the lowest level and when I went to cream the butter and sugar, I ended up with a good amount of buttery sugar mess all over my counter, on my face, and in my hair. Good thing it tasted yummy. 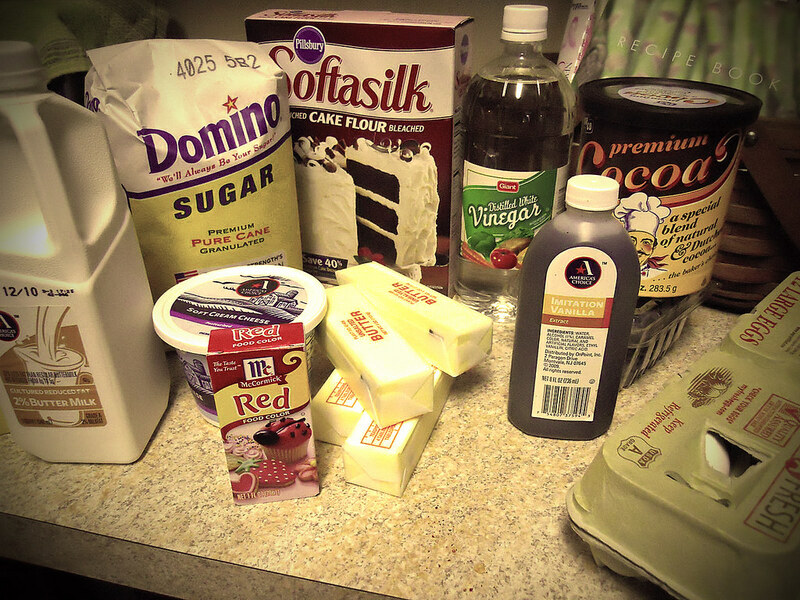 The next exciting moment occurred when I had to add the red cocoa powder in with the fluffy butter/egg/sugar mixture. Somehow I got a bit of red chocolate paste on my fingers and then proceeded to scratch my leg under my white dress and well, I bet you can guess what happened. Needless to say I have to pick up some bleach. What kind of fool makes Red Velvet Cake while wearing a white dress? Fast forward to the part when you mix the baking soda and vinegar together. That was exciting! I forgot that when you combine baking soda and vinegar it sizzles and bubbles like crazy. Do you know why the baking soda and vinegar are key to a tasty Red Velvet Cake? Vinegar (acetic acid) + Baking Soda (sodium bicarbonate) = CO2 (carbon dioxide gas) In plain English: Gas is what causes the cake to rise. When I folded the baking soda/vinegar into the cake batter, I noticed a change almost immediately. The texture was smoother and the batter seemed lighter. I poured it into my cake pans (greased with Crisco and dusted with cake flour) and baked the red beauties for 30 minutes. After the cakes cooled, I layered them on my gorgeous glass cake stand and got to work on my frosting. I doubled the recipe Mrs. Deen uses (my alterations have been made to the recipe below) and added vanilla extract. My frosting was fluffy, creamy, and oh-so-tasty. As I plopped the frosting on top of my cake, I realized I’d made my first Yankee Challenge error ever. I stacked the cakes on top of one another before adding a layer of frosting in-between. The cakes were so moist that they were stuck together, so I couldn’t repair my boo-boo. Thankfully, my hungry cake-eating-friends said they didn’t even notice the missing frosting layer. 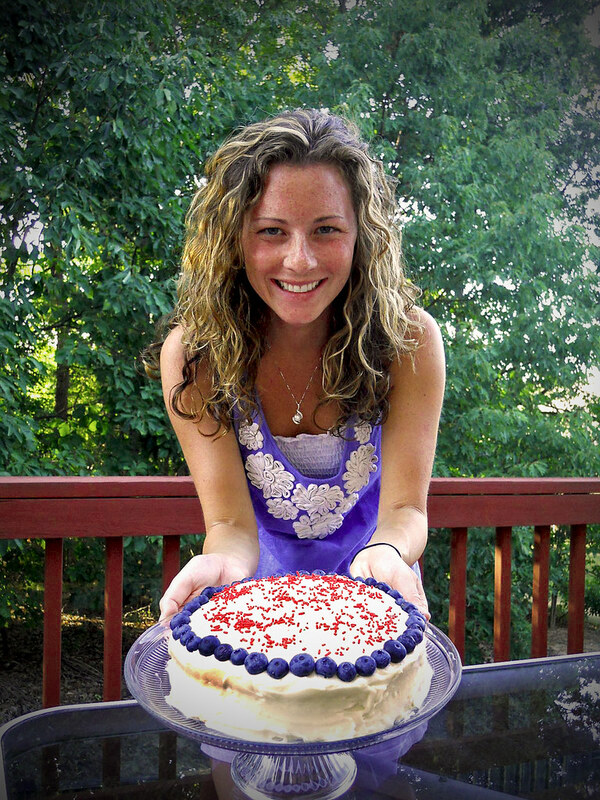 I added blue sprinkles and blueberries to the top of my cake in honor of the Fourth of July holiday, and I must say that they were a nice addition. Everyone that was lucky enough to get a piece said that the cake was “decadently delicious“. My first Red Velvet Cake from scratch will not be my last. Now that I know it’s not too hard to make, I will save my money by baking my own. Preheat oven to 350 degrees F. In a mixing bowl, cream the sugar and butter, beat until light and fluffy. Add the eggs one at a time and mix well after each addition. 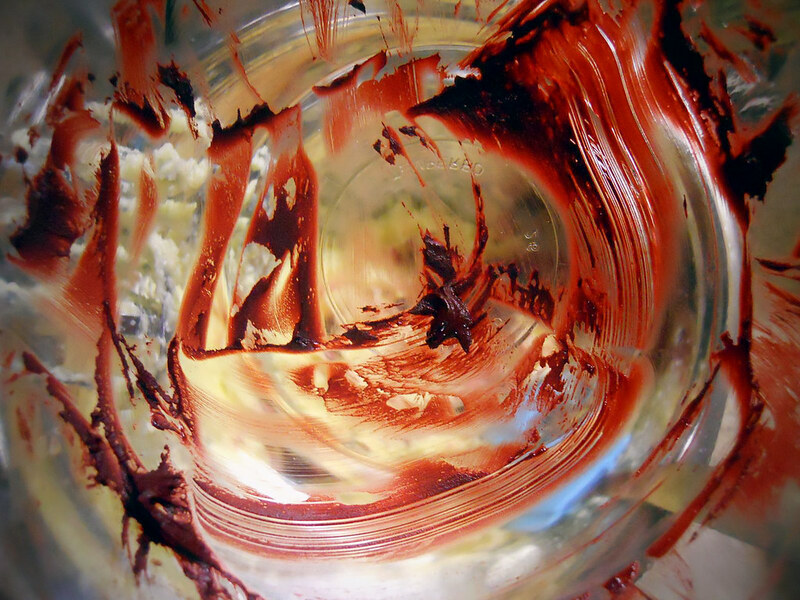 Mix cocoa and food coloring together and then add to sugar mixture; mix well. Sift together flour and salt. Add flour mixture to the creamed mixture alternately with buttermilk. Blend in vanilla. In a small bowl, combine baking soda and vinegar and add to mixture. Pour batter into 2 (8-inch) round greased and floured pans. Bake for 20 to 25 minutes, or until a toothpick inserted into the center comes out clean. Remove from heat and cool completely before frosting. Blend ingredients together in a mixing bowl. I love a good Red Velvet Cake. It’s one of our family’s favorites and is often requested for family reunions and special occasions like birthdays. Here’s a link to my recipe: http://www.lanascooking.com/2009/06/08/red-velvet-cake/ Just slightly different in that I use toasted pecans in the frosting. This sounds yummy! I love red velvet cake. It’s actually quite popular down here in Miami too. Every event I go to recently has mini cupcakes (one of the top catering trends right now) and red velvet is usually part of the mix. I’ve taken it upon myself to ‘taste’ each of them and compare recipes between the bakeries…fun research that’s for sure! this. looks. amazing! i thought so when i saw it on your FB. yum, yum YUMMY! great job little bear!!! it looks (and sounds) like it was a success!!! You know it is my favorite, and I cannot wait to try out this new recipe. That will be my excuse to break my diet again!! I lost my beloved Red Velvet cake recipe when my computer harddrive crashed and tried this one from Paula’s site. My family for the first Christmas ever did not finish it! they told me it was way to dry and did not have as good of taste as my old recipe. I noticed that it uses butter instead of oil and mine also had cocoanut extract as well as vanilla. A very gracious southern wife of an Army General gave me my recipe and when people ate it they actually offered to pay me to make them one at various functions but I always passed it on as it was to me. I have searched the internet for anything close and cannot find it. If you find one and try it you will never eat Paula’s again.